Alexander Peterc from Exane BNP Paribas issued a note to the bank's clients that only 2.2% of the people he surveyed have the intention to buy a Nokia Windows Phone this season - Nokia's Lumia WP line is currently represented by the Lumia 800 and Lumia 710 smartphones. With only 2.2 percent of surveyed buyers firmly intending to purchase the Lumia, Nokia's first flagship Windows Phone is ... far behind the current blockbusters, Apple's iPhone 4S and Samsung's Galaxy S II. 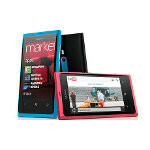 We've heard such predictions before, and Nokia has been refuting claims that the Lumia 800 isn't selling well, with some indirect proof for the opposite, but until the numbers are in officially, nobody knows for sure. It may be behind the blockbusters but I believe it will soon catch the pace and enjoy some of the cake. Android did that, it took start and seen tough competition but then apple was so afraid it was crying like a baby to sue Samsung everywhere. What happened? Android has a bigger share than iOS. Nokia is coming back. It will take some time but soon it will be back like old times. I am waiting to change my cell phone and waiting for Nokia 900. I will check its reviews if its up to my expectations, I will buy one otherwise my choice will be android (Samsung most probably) I will never buy crap*le (sorry i had to drop one "p", the msg below says it may hurt some ishe*ps. U can't believe bank analysts. They are earning money from stock changes caused by their fake rumours. these analysts are full of crap. i dont know how accurate the numbers are, but I do know that if the 900 were released it would be selling more than the other 2 combined. the 2 top selling phones are not middle to low range phones, they are "high end". if u want to get in the ring, put out a high end WP7 phone.. something thats been hard to find. This is so incomplete I don't know where to begin. Did any of the other 800 people already own a smartphone? Is this in the next month, year, or simply next phone? I plan on buying a new smartphone but not for 6 months when my contract is up. Would that put me out or in the survey? My next phone will be a WP7 not sure which one yet(I'm on Sprint and they have nothing). But this survey is too full of nonsense to mess with an outlook for a company! !